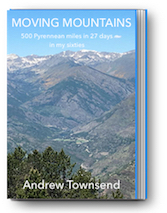 In the summer of 2016, just after my sixtieth birthday and inspired by one of my heroes, Catalan ultra runner Kilian Jornet, I decided to embark on an odyssey to the Spanish Pyrenees. I resolved to run the length of the Pyrenees from Cap Higuer on the Atlantic coast to Cap de Creus on the Mediterranean Sea. The run would cover a distance of 500 miles and a vertical ascent of more than 100,000 feet and what’s more I planned to complete the journey in just 21 days which would mean running the equivalent of a marathon a day. The route would take me from the Basque Region in the far north west Spain, through Navarre and Aragon before finishing on the volcanic landscape of Cap de Creus on the Mediterranean coast in Catalonia. I wanted to travel light so I decided to fit everything I would need for three weeks in a “runners” backpack and find places to stay en route. There were various guide books but I decided, as usual, to do my own thing although I would base the run loosely on the legendary GR11 “La Senda” trail. I knew this was going to be an unforgettable experience and with that in mind (and knowing my memory!) I reserved a bit of rucksack space for my notebook and pen. The result of this is “Moving Mountains”. The clue is in the title – what, on the face of it, was a hard physical challenge, turned into a life-changing journey of epic proportions where I had to face my fears, and confront my inner demons, where I experienced huge highs, huge lows, loneliness and friendship in equal proportions and where ultimately I learnt about how to live in the moment and celebrate life fully. “Moving Mountains” is my story and I have started a site to chronicle the journey and to give you a preview to the book and to give you a taster of some of the things you can expect to find in the finished article! Click here to be taken to the new site.